Israeli civil rights groups are planning to challenge a new law designed to stop boycotts of products from West Bank settlements. The ban on any "geographically-based boycott" was passed on Monday. The law has been strongly condemned as "deeply undemocratic" and a violation of freedom of expression. Petitions against it are to be filed in Israel's High Court. One group is also calling for a boycott of olive oil and wine from settlements. The law enables the filing of civil lawsuits against Israeli individuals or organisations who openly appeal for a boycott. No evidence of actual financial damage is required by the party suing for damages. The Association for Civil Rights in Israel says the new law is "unconstitutional and anti-democratic" and sets a bad precedent. It is demanding its disqualification by the High Court. Gush Shalom, an organisation which campaigns for an end to Israel's occupation of Palestinian territory, is also pledging to challenge the law on legal grounds. It said the legislation aimed "to silence criticism against the government's policies in general and its policies in the occupied territories in particular, and prevent an open and productive political discourse, which is the backbone of a democratic regime". A coalition of four rights groups - Adalah, a legal rights organisation for Israeli-Arabs, Physicians for Human Rights, the Public Committee against Torture and the Coalition of Women for Peace - says it will join legal appeals. Peace Now has already taken a different tack, directly defying the new restrictions. It is using posters and social media to call on the Israeli public to boycott Ahiya Olive Oil and Psagot Wine which are produced by Jewish settlers. Its Facebook group, "So Sue Me, I'm Boycotting the Settlements", already has more than 7,000 likes. Israel has occupied the West Bank since the 1967 Six Day War but its settlements are deemed illegal under international law. Continued building in the settlements derailed the latest peace talks with the Palestinians who want the land as part of a future state. The "Law for Prevention of Damage to the State of Israel through Boycott" won a majority of 47 to 38 votes in the Israeli Knesset. It was proposed by right-wing politicians, angry at domestic dissent towards Israeli policies in the West Bank. Among the recent initiatives was a declaration by Israeli academics and artists that they would boycott the West Bank settlement of Ariel. Israeli developers also agreed not to use products or services from settlements when they signed on to help build a new modern Palestinian city, north of Ramallah. Speaking on Israeli Army Radio, the finance minister, Yuval Steinitz said: "Boycotts against the state of Israel certainly cannot be considered legitimate from Israel's point of view and boycotts against the settlements or any other region of the country are not a democratic way to determine democratic oversight." 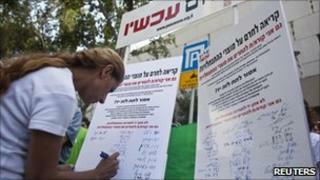 The Israeli media has criticised the Prime Minister, Benjamin Netanyahu, for not turning up to vote on Monday. However he has defended the legislation. "I approved the law. If I hadn't approved, it wouldn't have gotten here and it wouldn't have passed," Netanyahu said. "I am against boycotts aimed at the state of Israel in general, and I am against boycotts aimed at groups within Israel." The concept of boycotts is a sensitive one for Israelis, going back to a long-standing boycott by the Arab world that led some global firms to avoid doing business with Israel.